Most of the Syrian experts have already admitted that the Astana peace talks promote an early settlement of the Syrian crisis. Nowadays, it can also be noted, that these negotiations in Astana have shown high effectiveness for almost six years of the Syrian conflict. It is known that the negotiation process in Kazakhstan consists of several rounds. The first round took place on January 23-24, 2016, the second one was held on February 6, the third round is scheduled for February 15-16. It should be mentioned, that all sides achieved the agreement on the establishment a tripartite monitoring mechanism for the ceasefire in Syria after these meetings. In addition, the Russian delegation proposed a new draft constitution for Syria, which can promote a dialogue between the Syrian government and the Syrian armed opposition. The issue of the new Syrian constitution will be discussed during the third round of the negotiations in Astana. Besides, the agenda of the upcoming talks will include the issue of cessation of hostilities, and the adoption of the provisions of the Joint Task Force on Syria. In the framework of the negotiation process on Syria, the Syrian delegation, the delegation of the armed opposition,Jordan, as well as UN Special Envoy for Syria, Staffan de Mistura, and the U.S. were formally invited to the next meeting in Astana. It also should be mentioned, that nowadays the negotiations in Astana play a secondary role in comparison with the Geneva talks. 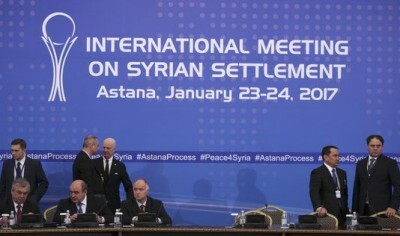 However, the Syrian president Bashar al-Assad believes that Astana has a good chance to become an effective platform for the settlement of the Syrian conflict. Despite all the arguments between politicians about the importance of the results of meetings in Geneva and Astana, we can already say with confidence, that Astana can become a full-fledged basis for the negotiations in Switzerland. This statement was confirmed by UN Special Envoy for Syria, Staffan de Mistura. He said that the meeting in Astana would make a significant contribution to the preparations for peace talks in Geneva.